In this series, the products are provided in three types: MTS 8000, W/M and prototype. The MST 8000 type is made by plastic resin with black surface treatment, which is perfect for UTS V2 batt con battery. Another one which is also made by plastic resin is mainly for door rear left, and it is named W/M type. 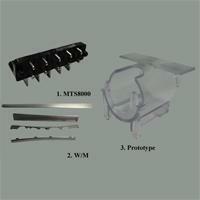 The third type is generally called prototype, and we provide this one as chips holder. The chips holder molding part is made by PC with transparent surface treatment. We are not only trustworthy for metalworking product, but also well-known for surface treatment technique. Besides, we provide negotiable order quantity and customize service. If you are interested in our products, just send your inquiry or contact us for more details.